In October, I laid out here the goals I set in the summer and, motivated by Alyssa Villareal’s fall post, committed to reporting back and holding myself accountable to them. This fall, without going down the rabbit hole of politics, I’ve found myself struggling to stay on my path and focus on teaching–as I have in the past when facing personal or family challenges. From time to time, we all have stumbles for one reason or another. Going back to those goals I set months ago, is helping me to refocus and not lose sight of getting better at what I do. Here’s where I am so far on my goal of providing more comprehensible input (overlaps some with cultural goal). I put together a lesson on Mexican Independence Day for elementary ages (a holiday I’ve avoided because I didn’t think I could stay in the TL). I used a combination of readings I found on line, taught the children el Grito de Dolores and did Movie Talk with a video of President Peña Nieto reciting el Grito on Mexican television. Finally we watched, with sound, el Grito and the students joined in–yelling out the words and Viva! By using lots of pictures and drawing comparisons with what they already know about their country(referring to George Washington, Martin Luther King Jr), we were able to explore the heroes of Mexico’s history through el Grito, in the TL. I used a purchased mini unit on Quinceañera to use with my 7th graders during their identity unit, which provided great input and cultural comparisons-many of my students celebrate their b’nai mitzvahs and found a lot of opportunity for acquiring language to talk about and compare the two celebrations. The materials provided readings, videos and music that engaged my students in a variety of ways, offering lots of repetition of key phrases and vocabulary for making comparisons. Finally, I invited one our teachers to come in and talk with the students about her Quinceañera(with amazing photos). With this same group I also did a mini unit on Shakira’s Bicicleta and Bomba Estereo’s Soy Yo, which really filled out our unit exploring identity. Again, this engaged the students with music, video, photos and reading. I did not create any of these materials, rather carefully selected other teachers’ awesome work to use with the students. The kids had fun, and acquired lots of new language. I found all of the materials on Teachers Pay Teachers and teacher blogs. 2-everyone reading an assigned story because it ties to a bigger class unit/discussion. Sometimes this form is written on the board, or they have it in hand. 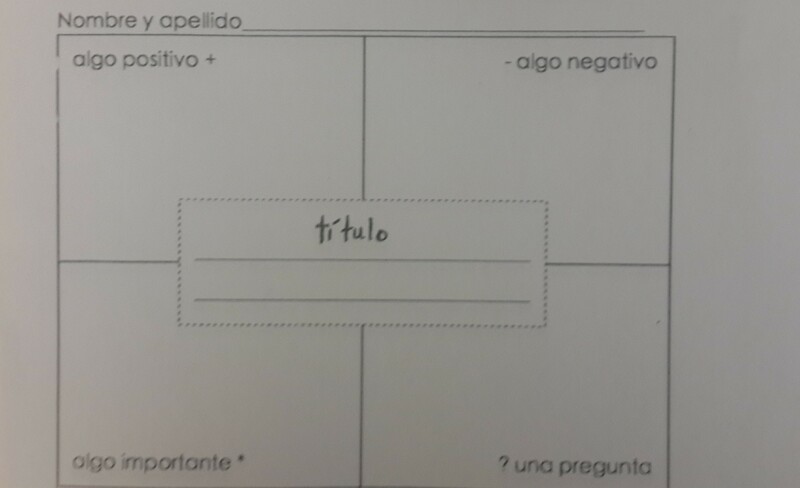 With my 6th-8th graders, who have acquired more language than the early elementary children, I then use it for an interpersonal activity in which students share their findings in a conversation with a partner in the TL, and are encouraged to ask questions about what their partner read. I use TALK scores to keep them accountable on that. Overall, I see the students working more at their individual level, engaging with the material and participating without lots of pressure to perform during every class. More to come on my goals around art as comprehensible input, and deeper cultural work. In the meantime, I continue to put one foot in front of the other.